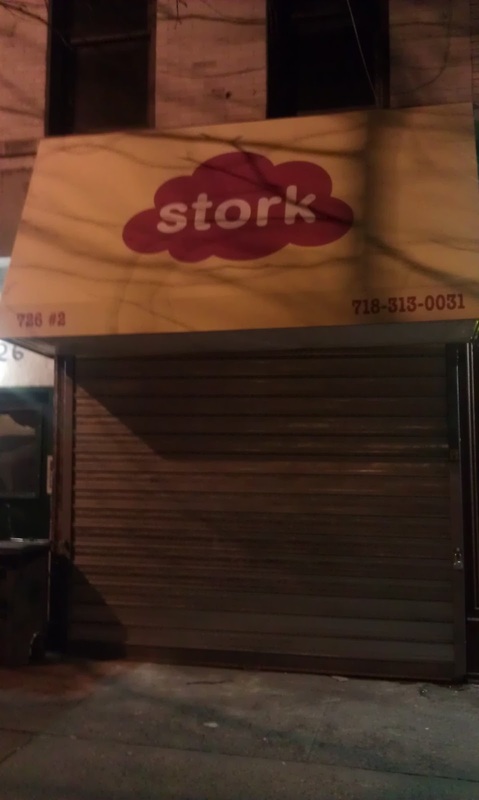 - Stork, Franklin's soon-to-be store for little ones, hoisted its awning over the weekend, and is still aiming for an early-March opening. You can follow their progress on their site, which is acting as a construction blog/anticipation-generator at the moment. - Right across the Avenue, Bella Greens has added soups and wraps to their menu, and as of last Thursday, they're now offering bagels from Bagels by the Park in the mornings. 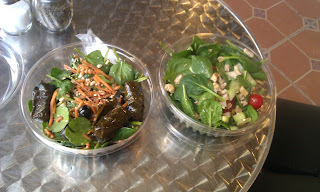 Their salads remain delicious, sizable, and only six dollars, so if you haven't tried one yet, swing by. - In what might be sadder news, A Slice of Brooklyn was inexplicably closed when I went by earlier this evening. It's a tough economy out there, but I hope they're ok - the lady and I have a great affinity for the Slice because their grand opening coincided with our first day on the Avenue, and because Judy and Elwin are such nice folks. Anyone know anything more? - Finally, Fox5 reports that 108 guns were taken off the street at Bedford Central Presbyterian Church over the weekend as part of the NYPD-clergy gun buyback program. The New York Times ran a piece in their real estate section today comparing five pairs of New York City neighborhoods. Entitled "So You're Priced Out. Now What?," the article includes a comparison of Carroll Gardens and Crown Heights North, suggesting that those who enjoy the former's "congenial mix of the traditional and the retro-modern" can find the same in our own neighborhood "for a fraction of the cost." ILFA spoke with the reporter last week, and my count of new businesses since 2008 made it into the article, as well as a quip about our new bars bearing a resemblance to those along Smith Street. I must confess that I wish a slightly different quote of mine had made it in (though I've learned not to get to cross about these things - they pass through several editors and, unlike a blog like this one, have word count limits), namely, the point that while many brokers and real estate reporters have characterized Franklin/Crown Heights North(west) as an extension of Prospect Heights in years past, it seems as though writers and realtors are starting to understand that the neighborhood has its own unique charms, history, and character, distinct from its more ballyhooed neighbor to the west (Mike F made a similar point in response to ILFA's HuffPo article a week or so ago). Readers, your thoughts? Is this an apt comparison? What are the implications of such a comparison (in the Grey Lady, no less)? In other news, the Department of Buildings permits on the plywood in front of 3D's at Franklin and Sterling suggest that whatever becomes of the space, it will remain a restaurant. The owners told ILFA over a year ago that they were planning a renovation, though I wonder if that's still the case (they were in business for 30 years before this, and they do have a spot over on Washington). Anyone know anything more? Also, a chat with the owner of Bombay Masala last night revealed that they are indeed hoping to open an Indian/Bollywood-themed bar in the space currently occupied by Ebita Realty. As planned, it would serve Indian beers and wine, have a back garden connected to the current one behind the restaurant, and feature music from the subcontinent, including live performances. However, as the owner said, he's in the "hoping" stage right now, and he added, gesturing around the restaurant, that he'd "need our help" to make it happen (this may refer to getting the plan past Community Board 8, as well as patronizing the new place once it opens). 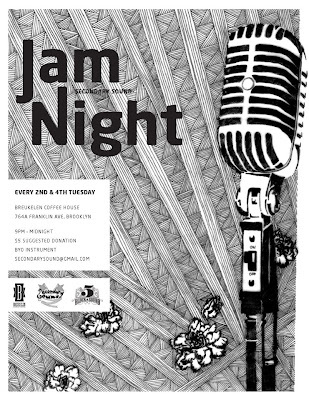 Brooklynians, get your dancing shoes on! Save Our Streets (S.O.S.) Crown Heights is pleased to announce its second annual Arts to End Violence contest and art show. S.O.S. 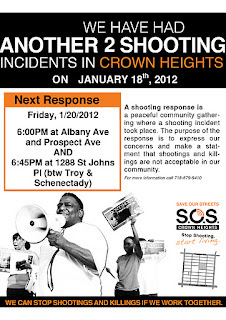 Crown Heights is a community-based effort to end gun violence in our neighborhood. The Crown Heights community has made a commitment to end gun violence. Merchants hang signs in their windows counting up the amount of days it has been since our last shooting; clergy members organize events to discuss violence in their congregations, teenagers speak to other teenagers about alternatives to violence; S.O.S. Outreach Workers and Violence Interrupters intervene whenever a shooting occurs to make sure no retaliatory actions take place. We invite the artists of Crown Heights and beyond to participate in our efforts to transform the neighborhood to make it a safe place for all. Last year the Arts To End Violence show brought artists together to share their own messages of peace and feelings about violence. Some of the participants were established in their field and others were new to the creative process. The results were a diverse group of powerful images and performances that invigorated the community efforts to reduce violence. We are calling on artists of all ages to submit art for this project. Artists 19 and younger can submit in three categories (2-dimensional art, videos and t-shirt designs) to be eligible for cash prizes. Professional artists are invited to submit pieces to be part of the Arts To End Violence collection to be displayed in local galleries and untraditional venues such parks, Laundromats and barber shops. We encourage artists, gallery spaces, teachers, art programs and media to call us at 718-773-6886 or email mohena@crownheights.org and speak with Anthony to learn more. S.O.S. Crown Heights provides immediate intervention whenever a shooting occurs in the neighborhood, reaching out to the victim, friends, and family to ensure that a retaliatory shooting does not take place. S.O.S. Crown Heights works closely with neighborhood leaders and businesses to promote a visible and public message against gun violence. The goal is to end the spread of violence by encouraging local voices to articulate that shooting is an unacceptable behavior. At the end of 2011 shootings were down 38% in our catchment area. Guidelines for the youth contest are available here, and the call to professional and emerging artists is here. It's here! "Art Not Arrests," the fabulous installation proposed by local studio Ground Up Designers for the Crow Hill Community Garden this summer (the CHCA is supporting the project), launched their Kickstarter drive on Wednesday, and as of ILFA's modest donation, they're one-tenth of the way to their $4,500 goal. This fundraising push is for the initial materials, after which the project becomes a fundraiser for arts-based education to prevent violence and provide a positive outlet for local youth. I'm particularly in love with the creative-subversive use of those miserable plastic zip-tie handcuffs as creative, connective materials that community members can personalize as they weave them together, but there are a lot of great things about this project. For more information, watch the video or follow any of the links on the widget below, and get your donations in soon, because they're only running this campaign until February 10th! In other, unrelated news, Zach Goelman over at Epichorus has some interesting thoughts on the sensationalist Gothamist piece about one Orthodox landlord's reaction to new arrivals, and Franklin Park, by way of the Reading Series, landed a mention in luxury-vacationing guide Conde Nast Traveler (someone's always discovering Crown Heights, though in this article, Franklin Park is lumped into Prospect Heights, which itself is the hip, young detour from a Park Slope literary tour). It was no surprise that President Obama made economic recovery the central issue of last night's State of the Union address. He rallied the base, threw some populist punches (I know he's supposed to be Mr. Competent, but could Mitt Romney have possibly picked a worse day to release his tax returns? ), and articulated a vision of fair and equitable economic growth that drew heavily, both rhetorically and substantially, on FDR's New Deal and LBJ's Great Society, and which positions him in stark contrast to whomever the GOP sends his way. One point the President returned to several times was how the fallout from the 2008 crash had landed disproportionately on the backs of middle- and working-class Americans (he could have added single-family households, women, and people of color to that list). 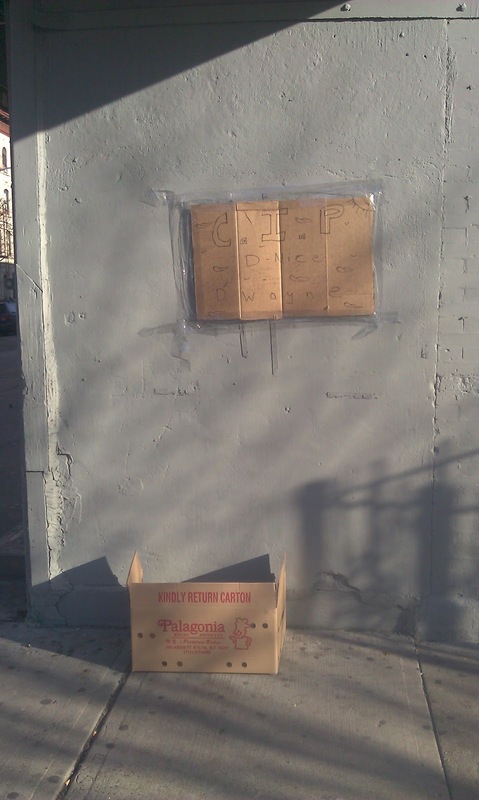 This is certainly true in Central Brooklyn. While NYC in aggregate has bounced back well from the recession (thanks in large part to the continued rakings-in of a few at the top) foreclosures have wreaked havoc on neighborhoods like Crown Heights - in my first year of blogging, back when I really was "walking around Brooklyn with a camera and a pen," evidence of their catastrophic impact was everywhere (taking photos in East New York, I was suspected of being a foreclosure agent). Unemployment numbers in Central Brooklyn are equally brutal - 15% as a whole, which rises to 16% for Hispanics and 18% for African-Americans, as of this summer. Thankfully, there are a number of local organizations working to provide citizens of these hardest-hit areas with the knowledge and access they need to get back on their feet. One is the Local Development Corporation of Crown Heights, which hosts a home-buying workshop tonight from 7-9pm at the First Baptist Church on Eastern Parkway (ILFA heard about this workshop from Councilwoman Letitia James, who often posts events of this kind on her blog). Another is the Pratt Area Community Council, who are hosting a workshop for small businesses on "Access to Capital," also tonight from 6-8pm (the Brooklyn Chamber of Commerce, who were represented at the most recent CHCA meeting, host similar events for small businesses). If you know people who would benefit from this information, pass it along - in my experience, it's not that these resources aren't out there, but that people don't know about them. - Gothamist posted an interesting piece today about clashes between Chabad landlords and new tenants in Crown Heights (with the requisite Gothamist flair, of course). - Brownstoner reported last week that the owners of Bombay Masala (an IFLA fave) have plans to put a "Bollywood Bar" in the space next door (currently home to a fantastic liquor and wine store that is not nearly as typical as it looks from the outside). Mike F and the Brooklynians are already practicing their dance numbers, but I'm wondering why they can't just put the new bar in the empty space next door to the liquor store to keep the lady and I from having to trek for our hard stuff. While I'm wishing for things I have no power to make happen, can we form a band called the Brooklynians that Mike F can front? Sounds very indie . . . The campaign for the Republican nomination may be getting all the attention in the national media, but this happens to be a big week for political pronouncements and events right here in Central Brooklyn. - Today (Tuesday), the Prospect Heights Democrats for Reform host a State-of-the-Union Watch Party at the Velvet Peach Cafe over on Flatbush, starting at 8pm. If you haven't heard of PDHR, they're a great group of folks committed to reforming Democratic politics in Brooklyn (and in a borough where registered Dems outnumber everyone else 7:1, Democratic politics is politics), and one of their own, Ede Fox, has launched a campaign to succeed our independent-minded (and fantastic) Council Member, Letitia James, when her term expires in 2013. Speaking of the Councilwoman, she's circulating information about a home-buying workshop on Wednesday from 7-9pm at the First Baptist Church of Crown Height on Eastern Parkway. - On Wednesday, if reform politics sound like your cup of tea, the New Kings Democrats host their monthly meeting at a new location, The Commons on Atlantic. Closely affiliated with PDHR on a number of issues, the New Kings have made waves with their challenges to machine politics in Brooklyn since 2008, and will likely be an even more organized and influential force in this year's elections (shameless self-promotion: ILFA's also got a couple of articles about NKD linked in a new little widget of extra-curricular writings to your right). - Finally, on Thursday, Assemblyman Hakeem Jeffries will deliver his "State of the District" address at 6:30 PM in the Pratt Institute's Higgins Hall, which should be a particularly interesting event as the Assemblyman gears up for a three-way race for Congress this spring. Lots to do in Crown Heights today! As ILFA posted on Thursday, PS 316 principal Olga Maluf and some of her devoted parents are hosting a meet-and-greet for prospective parents at the Candy Rush at 4pm on Saturday. Everyone interested in learning more about the great things 316 (on Classon between Sterling and Park) has to offer is welcome. Afterward, head on over to Five Myles Gallery on St. John's Place for the opening of January's Space Program show, a family affair featuring works by father-daughter duo Robert Toyokazu Troxell and Grace Sachi Troxell and music from Grace's brother Cooper Troxell. The fun runs from 5-8pm. Then, from 8pm - midnight, check out Okie Weiss's record release party at LaunchPad. Also, ILFA recently started contributing some ramblings to the Huffington Post's New York page, the first of which ran today (the short version: after years of writing about gentrification from my own admittedly limited perspective, I've come to feel the term fails to explain some key trends in Crown Heights, and that understanding the neighborhood means taking other long-term forces like (im)migration and community organizing seriously as agents of change and continuity. It's no revelation, but I do feel it's been missing from some of the more recent reports on the area.). I've written a few longer pieces of this sort in the past, and I'm hoping to have links to them posted soon. In the meantime (need I even say it), comments, critiques, and all manner of reprisals are most welcome. 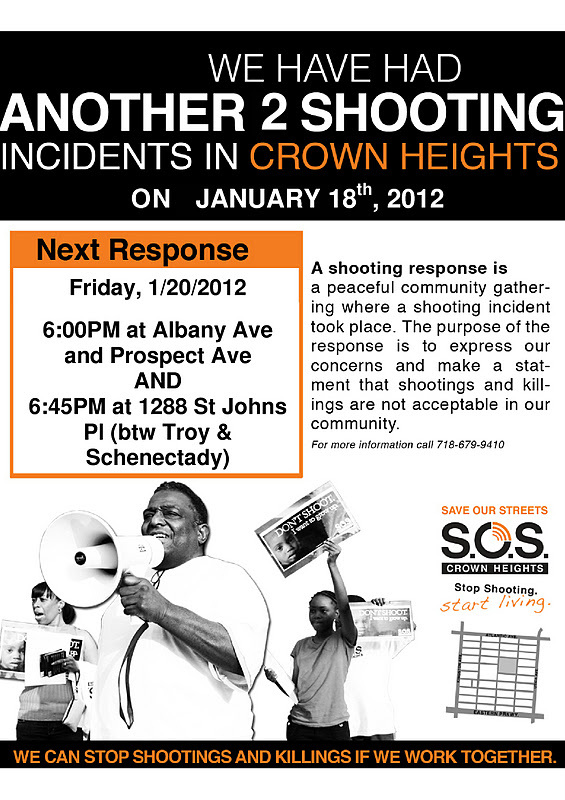 From the SOS Crown Heights team - if you're available, stand with them against gun violence in Crown Heights tonight. At WNYC's MLK Day celebration at the Brooklyn Museum last Sunday, "In MLK's Footsteps: Education as a Civil Right," an event moderated by award-winning interviewers Brian Lehrer and Jami Floyd, a teacher from Brooklyn asked one of the toughest questions of the day. The panel, she noted, had covered much expected ground: urban schools today are often more segregated than they were before Brown v. Board in 1954, housing patterns and funding structures exacerbate this de facto segregation, and separate remains unequal. Her school, however, faces a slightly different problem. Located in a "good neighborhood" (Clinton Hill) that is both "improving" and increasingly "integrated" on account of neighborhood change, the school continues to educate a population that is 99% African-American and poor or working-class. How, she asked, could she convince the newly-arriving white, middle-class residents of Clinton Hill to send their children to her school? How could her high-performing public school overcome the stigma attached to NYC's school system and attract the attention of the parents and children she saw out and about in the neighborhood? The panel didn't have a clear answer (though Newark Superintendent Cami Anderson, who was impressive throughout the day, suggested that "we need to have a long, hard conversation about this in the white community ... we often say one thing and do another when it comes to public schools. "), but, to be fair, no one else does. We know that parent involvement is critical to school success, but the question of how to attract middle-class investment in public schools is one of the thorniest that any school district can deal with, particularly in the context of school closures and neighborhood change. Attempts to open or co-locate charter schools (which often receive the lion's share of positive press about education) in increasingly middle-class neighborhoods, ostensibly for this purpose, have ignited firestorms in Park Slope, Williamsburg, and next door in Prospect Heights, with opponents accusing the Department of Education of privileging the needs and desires of prospective middle-class students over the education of those students who are currently enrolled. Still, as the Clinton Hill teacher noted on Sunday, schools need broad-based community support to survive and thrive. Can these public schools attract investment without failing their current students or falling prey to school closure? At P.S. 316 here in Crown Heights, principal Olga Maluf believes she can. Her school offers relatively small classes, excellent classroom-based technological equipment, and very good programs in art, music, and science (it's the rare elementary school with a science lab). While its scores are average to slightly-above-average, they're trending in the right direction. Though in-zone enrollment is down in recent years, one parent wrote to ILFA to suggest that "many neighborhood parents see the potential of the school" and "believe that PS 316 can be a jewel for the neighborhood and District 17." These parents organized last year to keep a charter from being co-located in the building, and now they're organizing to build local support for the school. Principal Olga Maluf will introduce herself and speak briefly about where the school is today and where she hopes to take it in the near future, and we'll all have a chance to mingle. Please RSVP to Kelly Bare at kellybare@gmail.com to ensure that we have plenty of snacks on Saturday, and feel free to contact her with any other questions about PS 316 as well. Tours of PS 316 will be held twice monthly. January tours are scheduled for the 20th and 27th. Please write Brenda Jones at bjones21@schools.nyc.gov to reserve a spot. Special thanks to Garnett Alcindor, Candy Rush owner and prospective PS 316 parent, for providing the venue. Safe in This Place Still Accepting New Participants (no prior theater experience necessary): Safe in This Place, a community-based theater and dialogue project, hosts its second session tomorrow at Georgia's Place (691 Prospect, at Bedford) from 7-9:30pm, and they're still welcoming more attendees into the fold. If you'd like to get involved, check the CHCA site (they're helping to sponsor the project) or get in touch with them at safeinthisplace@gmail.com. Help Make Franklin Bike Friendly: While they're still working together to bring an extended bike lane to Franklin, the CHCA and Transportation Alternatives are also circulating a petition to bring more bike racks to Community Board 8. Sign it here. 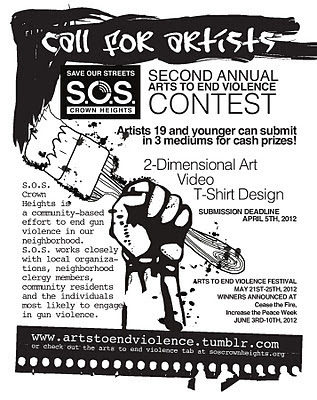 Arts Arts Arts: SOS Crown Heights announced their second annual Arts to End Violence Contest, which offers cash prizes to artists 19 and younger in three categories: two-dimension representation, video, and t-shirt design. The submission deadline is April 5, 2012. If you're older than 19 but still want to get involved, SOS would love to hear from you with ideas for how arts might be incorporated into their programming. In other arts new, the folks from Ground Up Designers showed off their award-winning design for the Crow Hill Community Garden (more to come on this once they launch their kickstarter campaign) and local muralist Claire from Imaginal Disc Art said hello and offered her skills as a muralist to anyone/any business in the neighborhood that would like to collaborate on a mural. State of the 57th: A representative from Assemblyman Hakeem Jeffries' office came by to invite residents to his "State of the District" address, to be held on Thursday, January 26 at 6:30 PM in the Pratt Institute's Higgins Hall. 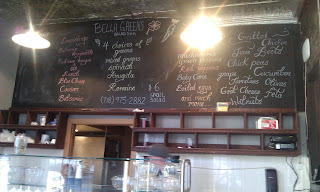 The lady and I finally tried the salads at Bella Greens on Monday, and they were delicious. At $6 for a five-topping small salad (certainly big enough for lunch) and $8 for a seven-topping large salad, prices are well below the usual Manhattan extortion, and Bella has a wide and growing array of toppings (I opted for spinach with carrots, cherry tomatoes, feta, olives, dolmades, and a balsamic vinaigrette). As of yesterday, they're also offering soups from Hale & Hearty, and they plan to add sandwiches and wraps to their menu in the near future. General manager Marc Genovese, who made our salads, is excited about the new venture from Chadon Bell (who also owns the Brooklyn Ink Spot), and is eager to hear from customers about what they'd like to see on their salads (Brooklynians, I'm looking at you). He plans to have Facebook, Twitter, and Yelp pages for the business soon (their wireless was being installed while we ate), which I'll link once they're up. Until then, you'll just have to swing by to say hello! In other local news, Pete Zaaz on Classon has been getting a lot of great buzz, and the former 3D's Bakery space (on the corner of Sterling and Franklin) seems to be prepping for a massive renovation. Anyone heard anything about the plans for the space? It's always unsettling to read of someone's passing, but when articles began to appear on Thursday night with photos of Duane Browne, who had just been shot to death in East New York, I was particularly affected. The 26-year-old smiling at me from my screen, his young son in his arms, looked eerily familiar. Browne had died in East New York, a neighborhood where I worked in elementary schools from 2008-2010, and I wracked my brain for some memory - had he been at a PTA meeting? An after-school track meet? Two years on, would I really remember him if he had? As it turned out, I recognized Duane Browne because he had lived less than a block from me for many years, and, like me, had frequented the Dean Deli Grocery. I realized this on Sunday, when, with the permission of the owners, Browne's friends erected a memorial against their wall. Inside, friends gathered occasionally to warm up and tell stories as the owners/clerks nodded sadly and kept everyone supplied with loosies. When I asked about the memorial, the young man (roughly my age, and Browne's) behind the counter shook his head and said "You remember him, right? He was always in here. They kill you in your own home . . ." He trailed off. The circumstances surrounding Browne's death remain murky - officers responding anonymous 911 calls reporting a home invasion claim they encountered him armed and uncooperative, while his family report that he was defending his half-brother from robbers and posed no threat to the police. The NYPD argue that their use of deadly force was justified by the pistol Browne carried (particularly after the shooting death of Officer Peter Figoski last month), while East New York residents, in an interesting piece by Liz Robbins (who reportedly has a piece on Crown Heights in the pipeline) cited this as yet another instance of police violence in a neighborhood that has developed a deep distrust for the NYPD. The Department has opened an investigation, but regardless of what it reveals, Browne's son must now grow up without a father. I'm not posting this to pass judgment. I just think it deserves notice that any life lost affects countless others across time and space, and that even as Crown Heights attracts attention for becoming safer and shinier, there are many in the neighborhood who live every day with the tragedies of gun violence. The Crow Hill Community Association (CHCA) was out cleaning up Franklin Avenue today in honor of Dr. King, who's birthday-holiday has become a national day of service. Volunteers gathered litter from the sidewalks and planter boxes between Eastern and Bergen, and filled the boxes with pine boughs from recycled Christmas trees, which looks and smells nice and will hopefully discourage their use as trash cans or ashtrays. Thanks to everyone who came out and volunteered, and thanks to The Candy Rush for providing coffee. Also, kudos to the storefront churches, whose sidewalks were spotless (though this may be a feature of cleaning up the morning after their services). If you'd like to get involved, or just want to learn more about the CHCA, come out to the Gospel Tabernacle Church (725 Franklin) for the first meeting of 2012, tomorrow (Tuesday) at 7:30pm. If you can't make the meeting, check out their website and their new list of local service organizations in need of volunteers for lots of great ways to make an impact in Crown Heights. There are several excellent ways to honor King's legacy right here in Crown Heights this weekend. I've copied the announcement from the Crow Hill Community Association about their community clean-up on Monday, which ILFA will be attending, in full below. If you've got little ones underfoot, the Brooklyn Children's Museum has events on Saturday, Sunday, and Monday, and if you'd like a stimulating discussion of Dr. King's legacy, check out or tune in to WNYC's annual MLK Day Event at the Brooklyn Museum, "In MLK'S Footsteps: Education as a Civil Right" (last year's event was truly fantastic, and this year's, with a timely topic and a killer lineup of panelists, should be just as good). - Safe in This Place, a community-based theater and dialogue project, hosts its first session tomorrow at Georgia's Place (691 Prospect, at Bedford) from 7-9:30pm. Check the Crow Hill Community Association site (they're helping to sponsor the project) or get in touch with them at safeinthisplace@gmail.com for more information. - NY1 ran a report on Monday's Town Hall Meeting about possible uses for the Bedford-Union Armory (including a video walkthrough of the site), which will be retired as an active National Guard training facility later this year and handed over to the state. Proposals from local residents included a track-and-field center, an archive for local and civil rights history, an after-school center, a food pantry, and an events space/arena (this last proposed by the folks from Gotham Girls Roller Derby). Ideas are being complied by students in Urban Planning at NYU for a study to be released in the spring (the enormous space could probably accommodate several uses). If you've got an inspiration, send it along to them at bkarmoryproject@gmail.com. - The Times reports that Hakeem Jeffries, after much preparation and speculation, will announce his bid to replace incumbent Ed Towns in New York's 10th Congressional District this Sunday. 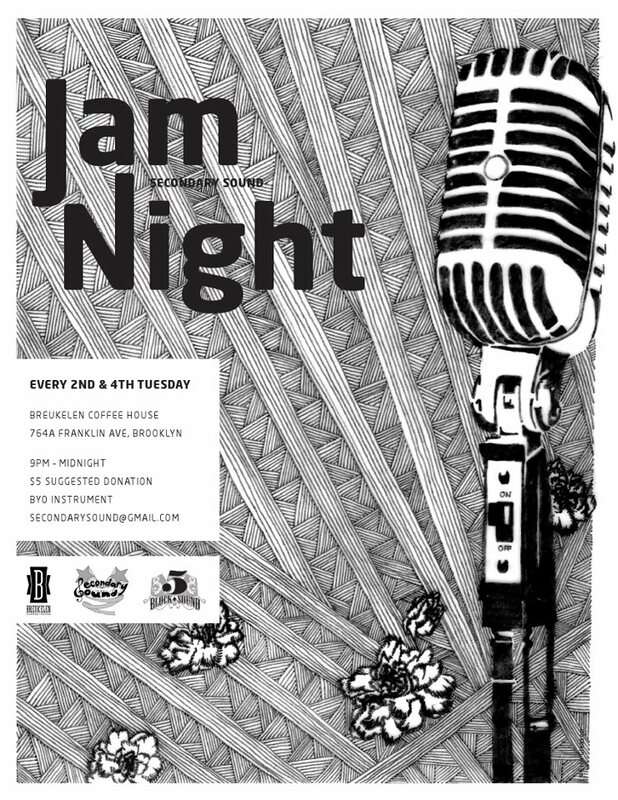 Sorry for the short notice on this one - thankfully, they happen every two weeks, so if you miss tonight's jam at the Breukelen Coffee House, mark your calendar for Tuesday, January 24. The basic info's on the flyer, and they're on FB and Twitter, too. 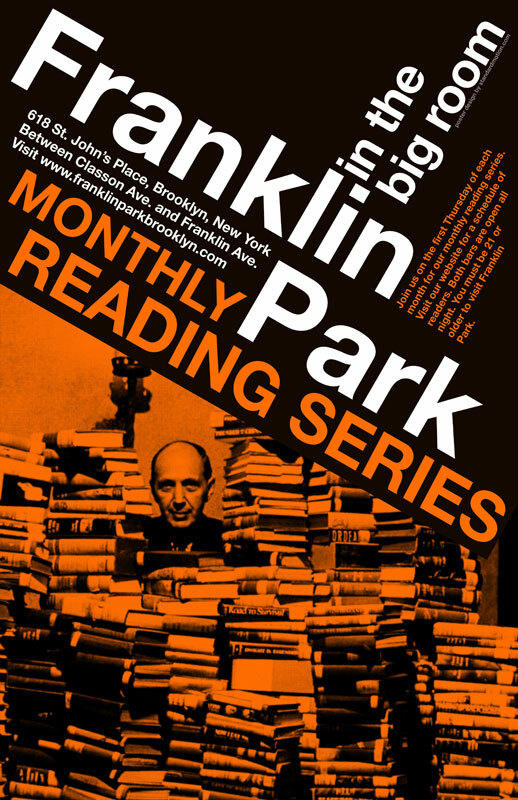 The first Franklin Park Reading Series of 2012 promises to be a great show, with literary luminaries Sam Lipsyte and Gary Lutz joining up-and-coming writers Catherine Lacey, Mitch Levenberg, and Christine Vines (a Crown Heightster) for the third annual short fiction night. To give you an idea of what a rare treat it is to have these writers in the neighborhood, leading literary blog The Rumpus calls Lipsyte today's "greatest comic novelist" and BOMB Magazine says "his sentences burn with the reckless and gaudy flame of homemade pyrotechnics," while writer Ben Marcus says Lutz "is a sentence writer from another planet, deploying language with unmatched invention." As usual, the drinks will be cheap and the show starts at 8pm (though given how much buzz this event has generated on blogs, events roundups, and twitter, ILFA recommends getting there early). We're super excited about our January 9 reading, which is our third annual short fiction night! Two of contemporary fiction's most acclaimed and influential authors, SAM LIPSYTE (The Ask, Home Land) and GARY LUTZ (Divorcer, Stories in the Worst Way), will be joined by new... stars CATHERINE LACEY (Fifty-Two Stories, The Believer), MITCH LEVENBERG (Fiction, The Saint Ann's Review) and CHRISTINE VINES, the curator of the Fiction Addiction reading series. As a sponsor of this special event, the literary magazine The Coffin Factory will be giving away copies of its latest issue to the first 50 attendees. SAM LIPSYTE is the author of the novels The Ask, The Subject Steve and Home Land, which was a New York Times Notable Book of 2005 and winner of the Believer Book Award. He is also the author of the story collection Venus Drive, named one of the 25 Best Books of 2000 by The Village Voice Literary Supplement. His fiction and nonfiction have appeared in The New Yorker, Harper's, The Paris Review, Tin House, Noon, N+1, McSweeney's, Esquire, The New York Times Book Review and The Washington Post, among other places. In 2008 he received a Guggenheim Fellowship. He lives in New York and is a professor of fiction at Columbia University. GARY LUTZ is the author of the short story collections Stories in the Worst Way, I Looked Alive, Partial List of People to Bleach and, most recently, Divorcer. His work has appeared in Noon, Conjunctions, Unsaid, Fence, StoryQuarterly, The Believer, Cimarron Review, Slate and other publications. His story “People Shouldn’t Have to be the Ones to Tell You” was featured in the anthology The Anchor Book of New American Short Stories. A recipient of a literature grant from the National Endowment for the Arts, he is currently a professor of English and composition at the University of Pittsburgh at Greensburg. CATHERINE LACEY has published fiction and nonfiction in Fifty-Two Stories, Cousin Corinne's Reminder, The Believer, elimae and other places. She co-owns and operates a B&B in downtown Brooklyn called 3B. MITCH LEVENBERG has published essays and short fiction in journals such as The New Delta Review, Fiction, The Assisi Journal and The Saint Ann’s Review and is the author of a story collection, Principles of Uncertainty and Other Constants. Two of his essays about his father’s experiences in the Philippines during the Second World War were included in the anthologies Pain and Memory and Common Boundary. Currently, he is working on a book of poetry, Transformational Love, and teaches at St. Francis College and New York University. He lives in Brooklyn with his wife and daughter. 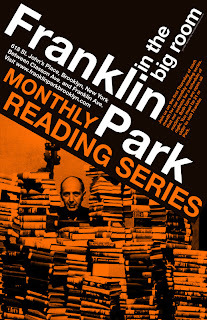 CHRISTINE VINES is a fiction writer and the curator of Fiction Addiction, a reading series in the East Village. She received a BA in English from Vassar College and lives in Crown Heights. This weekend, check out the first Target First Saturday of the year at the Brooklyn Museum, celebrating the achievements of the LGBTQ community in NYC and beyond. Monday brings a double bill, with an open house and town hall meeting on the future of the Bedford-Union Armory with Borough Prez Marty Markowitz at Medgar Evers College (see above) followed by the first Franklin Park Reading Series of 2012 (nice write-up in New York Magazine). Thinking ahead to next weekend, WNYC's annual MLK Day Event (on Sunday, not Monday) at the Brooklyn Museum is free and looks great. This year's theme is "Education as a Civil Right." The Brooklyn Children's Museum will also have a slate of kid-friendly events going all weekend to celebrate Dr. King. In other news, the new year brings death and rebirth - Roti 'N Dumplings on Union at Franklin closed its doors, while Bella's opened to rave reviews in the old Brooklyn Inkspot place on Franklin at Park. If you like old maps as much as ILFA does, check out the BHS "Map of the Month" for January (you can always spot our little corner of Brooklyn - it's just south of the village of Bedford). Finally, SOS Crown Heights is hiring, and a local tattoo artist is trying to become the "Ink Master" on Spike TV. Safe in This Place, a theater-based workshop series exploring what it means to be safe along the Avenue, is seeking participants from the neighborhood to take part in ten Thursday night sessions starting one week from today on January 12 (complete information is copied below from the Crow Hill Community Association). ILFA caught up with the organizers - three students in CUNY's innovative Applied Theater program who live nearby - earlier today to hear more about how the project was developed and what the workshops will be like. "Applied theater," as the organizers of Safe in This Place practice it, is built on the traditions of community-based theater and political theater in the United States and drama-in-education in the UK, and has an ongoing relationship with Theater of the Oppressed as developed in Brazil by Augusto Boal. As they put it, "we believe in engagement and reciprocal learning rather than coming into a neighborhood and telling people what the answer is to their problems." Examples of their work and the work of their colleagues include the Bar None Theater Project, which created original theater in a women's prison, and the St. Vincent's Theater Project, which addressed the closing of St. Vincent's in the Village. To develop a project like Safe in This Place, they conduct significant background research into the history and current state of the neighborhood (in this case, the space in which they live), including meeting with community groups, surveying local residents, and generally engaging with what's written and spoken about the area. As for the project itself, the goals are to "ask questions and open up dialogue" by "trying to crack open assumptions and the narratives that we're told about safety and figure out what it means for who is in the room and for this neighborhood." There won't be a "typical" workshop or a set format, but participants can expect a lot of games, small group work, and exercises ranging from the silly to the serious, and from familiar formats like story circles and improvisational exercises to more specific and directed work on the issues at hand. (While they warn that such workshops don't translate well to video, there are some examples online from the Creative Arts Team, including this one from Project Change). If this all sounds interesting and illuminating, considering committing to their Thursday night workshops. It's a great way to continue talking and thinking about these issues in Crown Heights. to explore what it means to be safe in the neighborhood along Franklin Avenue. “Safe in This Place” is a theater-based workshop series that will engage residents of northern Crown Heights – specifically the neighborhood around Franklin Avenue – in exploring the question: “What does it mean to be safe in this neighborhood?” It will culminate in a public event in March that will be designed by participants to share what we’ve discovered and extend the dialogue to more people in our neighborhood.